Amador, J., Weston, T., Estapa, A., Kosko, K. & De Araujo, Z. (2016). Animations as a Transformational Approximation of Practice for Preservice Teachers to Communicate Professional Noticing. 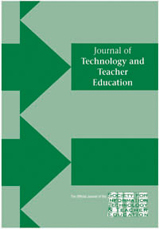 Journal of Technology and Teacher Education, 24 (2), 127-151. Waynesville, NC USA: Society for Information Technology & Teacher Education. Retrieved April 25, 2019 from https://www.learntechlib.org/primary/p/171240/.